For lesbians who want outrageously satisfying relationships. (YES, it’s possible)! The easy part is falling in love. The impossible part is seeing how we show up in ways that interfere with getting the love we want. Don’t worry. We’ve got your back. Imagine a safe setting, where you can share your hurts, desires and frustrations without being shut down, shut out, or met with a defensive response. Imagin being able to listen to her share her concerns without feeling blamed or criticized. Yes, it sounds unbelievable. We get it. All we can say is, it’s 100% possible. We are Michele and Kristen O’Mara and we are quite simply obsessed with love and relationships. We exist to grow love. Yours and ours. Wanna join us for an adventure? HOW DO WE KNOW THIS WILL BE RIGHT FOR US? You will work with a lesbian relationship specialist. Couples counseling is a specialty. This means that you are working with someone who has significant additional training beyond a counseling degree. Additionally, the specialist is experienced in, and aware of, issues specific to lesbian couples. Michele O’Mara is one of the few people in the United States that fits this description. For more information about her, read this. Learn from the three main relationship theories. Imago Therapy; Gottman Method, and Emotionally Focused Counseling. Michele is certified in Imago Therapy, trained in all three levels of Gottman Method, and she has completed a weekend training with Sue Johnson, Founder of EFT (Emotionally Focused Therapy). Experience relevant and unique care explicitly designed for lesbians. Most relationship services and supports are designed with heterosexuals in mind. The issues for lesbians, however, are unique and you cannot cut/paste issues from heterosexual relationships to lesbian relationships. Retreats are more cost-effective than couples counseling. In addition to gaining learning experiences that are not possible in couples counseling, the Retreats offer you 14 hours of intensive learning at 43% less than it would cost you to get this information in couples counseling. Retreats expedite your relationship growth and healing. You would need roughly three months in couples counseling, going weekly, to gain skills and knowledge you will gain in 3-4 days. There is nothing that compares to Adventures in Love. A vacation + relationship enrichment + friendship building + novelty, adventure and new experiences. What is your philosophy about relationships? There is no “right way” to do relationships, just the way that’s right for you. Our goal is to help you get the information and skills needed to create your version of a deliriously satisfying relationship. Finally, a safe place to be exactly who you are, and to show up without apology or self-consciousness about your relationship. 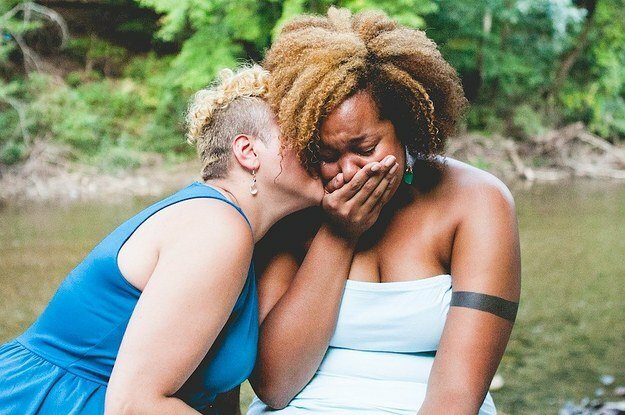 Lesbian couples have unique relationship dynamics. 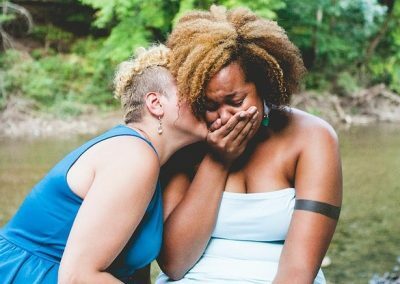 When you surround yourself with other lesbian couples, you are able to normalize your relationship in ways that are not possible in a setting with other heterosexual couples. Relationship growth can be fun when it’s done right! We believe in the power of joyful, positive learning environments. When we are in novel settings, our senses are heightened, and we can more effectively absorb and remember new experiences, insights, and skills. There are no “bad guys,” in relationships. What is the setting, schedule, size, and format of retreats? The retreats are held in clean, contemporary/updated, and comfortable Airbnb’s. A comfortable home-like settingfosters a casual and relaxed vibethat we consider essential for maximum safety and openness to the learning experience. The sessions take place in a group setting,and they include a combination of lecture, role-playing new skills(volunteers only, don’t fret), group discussion,as well as specific couple’s work (other couples observe the couple working through something using the new skills being taught). Every retreat schedule varies from location to location, depending on the Adventure options for your retreat location. Because free-time, adventures, and play are also essential ingredients of our retreat, we strive to create a perfect balance between work and play. All custom retreats offer a minimum of 14 hours of retreat sessions. Most sessions are 2-1/2 to 3 hours at a time, with large breaks in between. The most common schedule is a morning gathering (9:00am – noon) and an evening gathering (6:00pm – 9:00pm). This leaves midday for playtime. Some retreat will offer an entire free-day, depending on the adventures offered in those locations. Custom retreats are limited to 6 couplesto provide specialized attention within the group setting to each couple’s unique relationship needs. Each partner (every participant, not just every couple) receives a link to a confidential online relationship assessment created by Michele O’Mara. Once completed, Michele reviews the responses of all retreat participants which allows her to get to know your relationship through the eyes of each partner. From these assessments, Michele identifies the areas of concern for each couple, as well as the common areas of interest among all of the couples attending. The general focus of the retreat is based on the common issues and needs of all couples in attendance. While each pair is addressing different specific issues, the skills we learn to address these issues are the same. For example, a common issue for couples is to have a goal to heal old hurts in their relationship. Each couple does not have to have the same hurts to relate to the strategies and skills involved in healing hurts. Similarly, discussing differences (also known as conflicts) is a common issue. Your “differences” that need to be addressed do not have to be the same to develop the skills to communicate about conflicted topics effectively. While all of the retreat work is done in a group setting, each couple is provided with opportunities to do their individual work within the group setting. This does not appeal to all couples, and therefore is not required. Your safety and comfort are of utmost importance to us, and you will always be 100% in charge of what you share and how you participate in the retreat experience. If you are not comfortable sharing about your relationship in the group setting, you will still gain valuable skills and insights from the couples who are comfortable. Of course, the higher your risk to open to this experience, the greater your reward. What can we expect to gain from the retreat? The retreat is a launchpad to a new and better relationship. You will learn practical skills and strategiesto prepare for an outstanding relationship, heal a wounded relationship and enrich an already great relationship. We will assist you in developing a personalized relationship flight planto help you incorporate and practice the most important new skills and strategies for your relationship. You will deepen your understanding of yourself, your partner, your relationship. You will have fantastic memoriesof great adventures, new friendships, laughter and good times, along with a shiny new toolbox stocked with relationship toolsyou know how to use. Once you attend a retreat, you become a part of our Adventures in Love Tribe. Our goal is to grow with your relationship, continuously offer you relationship skills, information and supportto help you grow deliriously happy and satisfying relationships. As a member of our tribe, you will receive several exclusive benefits that are only available to retreat graduates. We will be adding benefits as we grow. Every retreat includes a comprehensive relationship workbook that is customized according to your particular retreat. Care is taken to get to know each couple’s concerns before the retreat. This determines the content that will be included in your customized retreat workbook. Each workbook includes roughly 100 pages. Have we mentioned, there is nothing cookie-cutter about the customized retreats? Retreat topics are based on the results of the couple’s assessments. Roles: Division of Labor, Finances, Gender, etc. Each participant (both partners) will complete a pre-retreat relationship assessment. This information is used to create a customized curriculum and workbook that is unique to your needs and those of the couples attending your retreat. The retreat is the start of a new way of relating to one another. Depending on your relationship needs, you may opt to sign up for post-retreat support options that include a variety of supports and services at a discounted rate. Every retreat becomes its own tribe of couples who share an intimate, exciting and enriching experience unlike anything you’ve ever experienced. This tribe of couples is your personal relationship support team during and after the retreat experience. Michele O’Mara has always been fascinated with relationships. Over two decades ago, she turned her curiosity into a career of helping lesbian couples prepare for, repair and enrich their relationships. While she has multiple degrees and certifications, what impacts her work the most is her sheer passion for helping couples grow their love, and her insatiable curiosity about how to do that better and better and better. 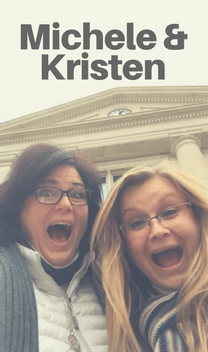 An educator by degree, Kristen discovered it is far more enjoyable driving students to and from school, than being confined to a classroom all day. When the wheels on the bus aren’t going around and round, she stays busy with their sons Mitchell and Cameron, ensuring their house always feels like a home, and she also active in the Army Reserves. Together, Michele and Kristen create the perfect pair to host Adventures in Love. They bring their crazy humor, easy-going personalities, authentic down-to-earth ways, and their loving big hearts to every retreat.